Nexium Control Esomeprazole Tablets are used for the short-term treatment of symptoms associated with reflux such as heartburn and acid indigestion. The presence of esomeprazole reduces the amount of acid produced by the stomach. You Must Be Aged Over 18 Years to Purchase This Product. MAXIMUM order quantity of TWO packs per order. Adults over 18 years, take one tablet daily with water. Swallow tablets whole do not chew. Each gastro-resistant tablet contains 20 mg esomeprazole. Contains sucrose. 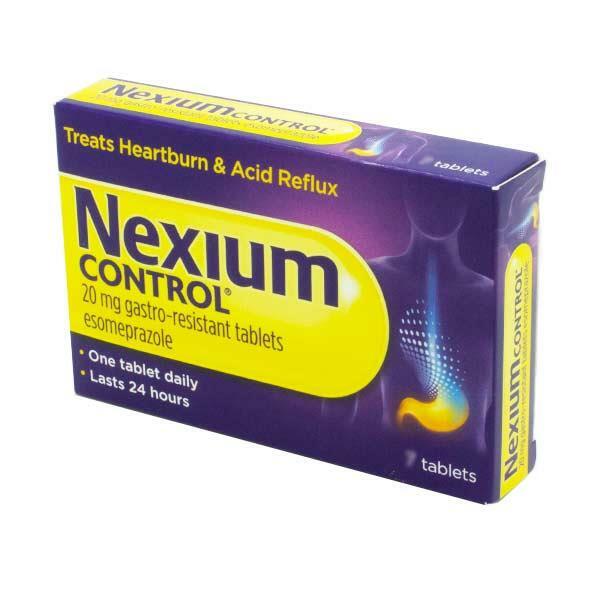 Nexium Control Esomeprazole Tablets treat the symptoms of reflux such as heartburn and acid indigestion. The presence of esomeprazole reduces the amount of acid produced in the stomach. These tablets do not give instant relief; it may take 2-3 days before you feel the effects. Nexium Control Esomeprazole Tablets should be used by adults over 18 years only. It may be necessary to take the tablets for 2-3 consecutive days to achieve improvement of symptoms. The duration of treatment is up to 2 weeks. Once complete relief of symptoms has occurred, you should stop treatm with Nexium Control. If you do not notice an improvement in symptoms after two weeks of continuous treatment, you should consult your doctor. If you are pregnant or trying to become pregnant, please consult your doctor before purchasing or taking Nexium Control Esomeprazole Tablets. These tablets should not be taken if you are breastfeeding. Common side effects (up to 1 in 10 people). Common side effects include headache, nausea or vomiting, diarrhoea, stomach ache, constipation or wind.